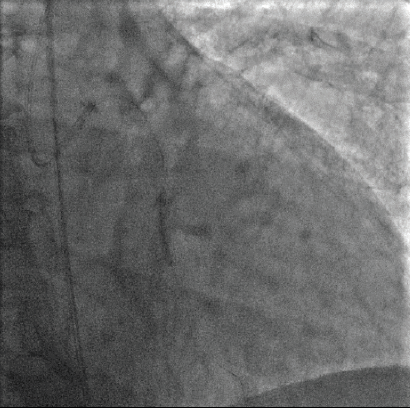 An 85-year-old woman with a medical history of coronary artery disease (CAD) (for which she previously underwent coronary artery bypass grafting [CABG] and subsequent placement of a stent in her left main coronary artery [LMCA]), severe aortic stenosis, and permanent pacemaker implantation presented to the hospital with chest pain consistent with unstable angina. Given the patient’s history and clinical presentation, the patient underwent cardiac catheterization to define her coronary anatomy. Her previous cardiac catheterization demonstrated a patent saphenous vein graft to the left anterior descending (LAD) artery, with severe stenosis of the LMCA bifurcating into the large left circumflex coronary artery. The native LAD was occluded as well. The right coronary artery (RCA) was also known to be occluded, along with an occlusion of the saphenous vein graft to the RCA. Her left ventricular ejection fraction (LVEF) was 60%. Figure 1. Right anterior oblique (RAO) caudal view of the left circumflex artery preprocedure. Cardiac catheterization upon her admission demonstrated severe in-stent restenosis of the LMCA, sequential high-grade stenosis (90%) of a tortuous mid–left circumflex artery, and a tandem severe distal circumflex coronary stenosis (Figure 1). These lesions represent a complex interventional challenge with delivery of balloons and stenting to treat the arterial coronary stenosis. The patient was deemed to be a poor candidate for redo CABG and she had failed optimal medical therapy including ß-blockers, long-acting nitrates, and calcium channel blockers. The decision was made to proceed with percutaneous coronary intervention (PCI) using an extra backup guide and a balanced middle-weight wire (BMW) to cross the lesions in the left circumflex. From the onset of the procedure, the ability to deliver a balloon and subsequent stent appears to be arduous and difficult given the tortuosity and calcification of the left circumflex. With introduction of a Guidezilla™ support catheter (Boston Scientific Corporation), a 2-mm balloon and a 2.5-mm balloon were introduced with difficulty in performing balloon angioplasty. 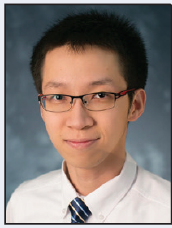 Despite balloon angioplasty, including a high-pressure noncompliant 3.5-mm percutaneous transluminal coronary angioplasty balloon in the left main coronary artery, stent delivery was challenging and complex. The introduction of the EluNIR™ coronary stent system (Medinol Ltd., distributed by Cordis, a Cardinal Health company) allowed adequate pushability and deliverability to cover both the distal-mid–left circumflex artery with two stents. The LMCA was also stented with a 3.5-mm EluNIR™ stent, resulting in an excellent angiographic result (Figure 2). The patient’s postoperative course was uncomplicated and she was discharged home the next day. Figure 2. RAO caudal view showing revascularization of the left main and circumflex arteries postprocedure. In summary, the EluNIR™ coronary stent system provides adequate deliverability and radial strength to treat both complex de novo angular lesions in addition to severe in-stent restenosis of the LMCA. The unique properties of the stent provide superior pushability and provide enhanced deliverability to tortuous and calcified lesions. An 88-year-old man presented with cardiac symptoms including intrascapular discomfort that may be an anginal variant, dyspnea with exertion, obstructive sleep apnea, and easy fatigability. His body mass index was 36 kg/m2. He also reported episodes of shortness of breath. The patient’s thallium stress test and echocardiographic findings were normal. He was previously seen by an orthopedic surgeon for leg pain. Duplex examination showed bilateral common femoral artery velocity reduction of 0.65 cm on the right and 0.64 cm on the left; the superficial femoral artery reduction was 0.39 cm on the right and 0.51 cm on the left; and the popliteal artery reduction was 0.33 cm on the right and 0.46 cm on the left side. Diagnostic angiographic findings demonstrated severe proximal, mid, and distal LAD arterial disease (Figure 1), as well as obtuse marginal disease. The patient was a poor candidate for surgical revascularization. Figure 1. Right anterior oblique cranial view of the LAD artery preprocedure. Figure 2. Right anterior oblique view of revascularization of the LAD artery. 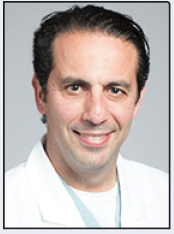 A right radial approach using a 7-F Glidesheath™ Slender device (Terumo Interventional Systems) was selected, and heparin was administered throughout the procedure. 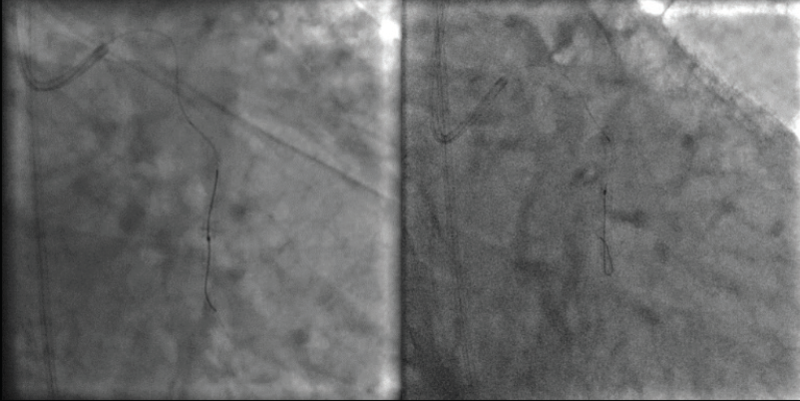 A 7-F XB LAD guide catheter was engaged after poor mapping of the first guide, followed by a 0.014-cm BMW guidewire. Balloon angioplasty of the proximal LAD was performed with a 2.5-mm balloon. A 4- X 24-mm EluNIR™ stent was deployed in the proximal LAD. The second stent, a 3.5- X 20-mm EluNIR™, was placed in the mid-LAD with the assistance of a GuideLiner® device (Teleflex). The very distal LAD artery lesion requires predilatation with a 2-mm balloon before deployment of the third stent, a 2.5- X 24-mm EluNIR™. A 3.5-mm noncompliant balloon was used to “touch up” the middle of the stents. The procedure concluded with no complications (Figure 2). Before the procedure, the patient had 90% to 95% proximal LAD stenosis and 0% stenosis postintervention. Findings also included extreme mid-LAD calcification (50%–70%) preprocedure and 0% calcification postintervention. The distal LAD stenosis was 95% before the procedure and 0% after stenting. However, there was approximately 60% to 70% distal LAD artery disease just above the wraparound portion, which was not treated. Fortunately, the diagonal branch that was located at the proximal lesion of the LAD was not placed in a stent jail. This case showed that EluNIR™ tracked well through calcium. Furthermore, even with aggressive postdilatation, EluNIR™ conformed and did not harm the vessel. 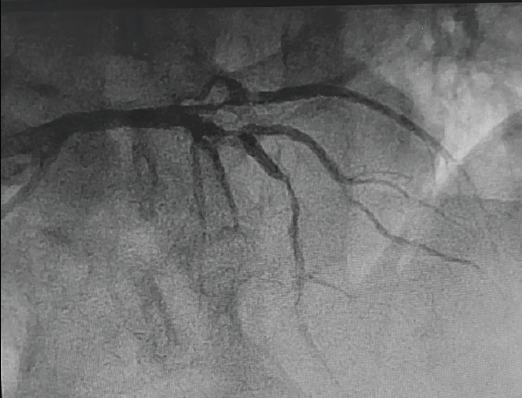 A 67-year-old woman with a history of CAD and PCI in 2009 was referred for elective coronary angiography due to recurrent angina and shortness of breath. Her chest pain continued to occur despite being on guideline-directed medical therapy. The stress test showed a defect in the inferior wall and transthoracic echocardiography demonstrated that her LVEF was 30% to 34%. The patient did not have history of left ventricular dysfunction. Left groin access was achieved under ultrasound guidance, and a 6-F vascular sheath was placed. 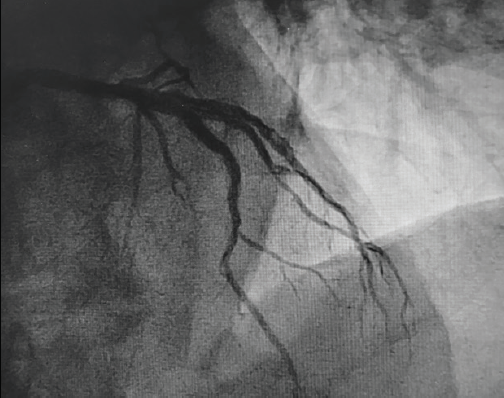 Selective coronary angiography was performed in multiple views, revealing total in-stent restenosis in the mid–left circumflex artery (Figure 1). After imaging review, we decided to intervene on the lesion. 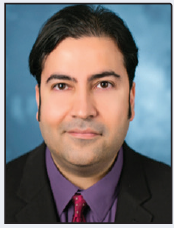 Bivalirudin was started and 180 mg of ticagrelor was administered to the patient. A 3.5-F XB guide catheter was used to engage the LMCA. We were able to cross the chronic total occlusion initially using a Runthrough® guidewire (Terumo Interventional Systems). The wire was exchanged for an HT Pilot® 200 wire (Abbott Vascular) and a 0.014-inch support catheter (Figure 2). Sequential balloon angioplasty was performed from proximal to distal parts using a 1.5- X 6-mm Sprinter® OTW balloon (Medtronic), and then a 2- X 12-mm Mini Trek™ balloon (Abbott Vascular) was utilized (Figure 3). 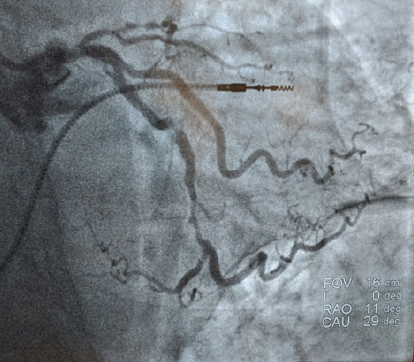 Laser coronary atherectomy was then successfully performed (Figure 4A). 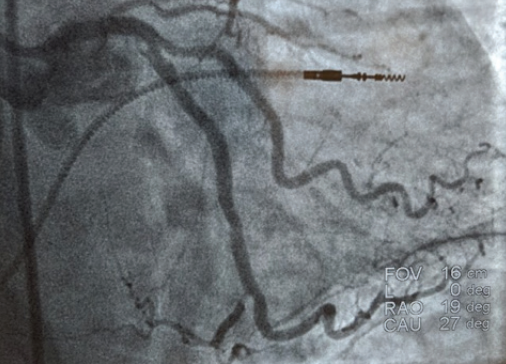 Postatherectomy coronary angiography revealed improved coronary blood flow (Figure 4B). Sequential balloon angioplasty was performed using a 2.5- X 20-mm Mini Trek™ balloon. Figure 1. Chronic total in-stent restenosis of the left circumflex artery in right anterior oblique caudal (A) and left anterior oblique caudal (B) views. Figure 2. Crossing the lesion with the wire and support catheter. Figure 3. Sequential balloon angioplasty at lesion after crossing. We then decided to place coronary stents. However, we had difficulty advancing the available stent even though the wire was changed to a stiffer wire and multiple techniques were attempted to no avail. We then tried a 2.5- X 24-mm EluNIR™ stent, and were able to successfully deploy the stent at the target lesion easily without any difficulty (Figure 5). We went on to deploy two more 3- X 24-mm EluNIR™ stents proximally, and finally, angioplasty with a 3.25- X 12-mm noncompliant Trek™ balloon was performed (Figures 6 and Figure 7A). Postprocedural coronary angiography demonstrated restoration of blood flow across the left circumflex artery with an excellent result (Figure 7B). At the end of the procedure, the patient left the cardiac catheterization lab stable and with no complications. The patient is discharged the next day. Figure 4. Laser atherectomy (A) and postatherectomy angiography (B). Figure 5. Deployment of the first EluNIR™ stent at the distal left circumflex artery (A) and postprocedure angiography (B) after a previous failed attempt at stent placement. Figure 6. Deployment of the second stent at the mid–left circumflex artery (A) and postprocedure angiography (B). Figure 7. Deployment of the third stent at the proximal left circumflex artery (A) and postintervention coronary angiography showing restoration of flow without residual stenosis (B). We presented a case with advanced in-stent restenosis and difficulty passing a stent, which was likely because of difficult anatomy due to earlier placed stent struts. In such circumstances, physicians can either utilize advanced techniques that might come with risks of complications or try a newer, easily deployable stent, as in our case, which was easy to track, navigate, and deploy with good results.